Light has the power to create the perfect atmosphere in seconds, so why not let us help you make the most of it on your wedding day? Whether you simply want the glamour of seeing your name up in lights, or you’re looking to create a fun backdrop for your day (and photos of course! ), we can put together something tailored just to you. 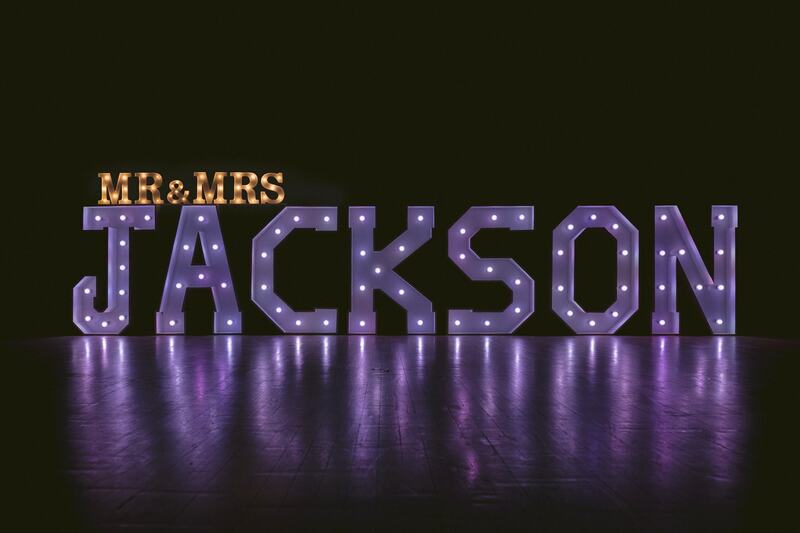 We have 100 illuminated letters in stock and can spell out almost anything, from the classic ‘LOVE’, to your surname or ‘Mr & Mrs’. Our giant letters can be a great way to add extra light to a dancefloor or brighten up older spaces such as barns; and if the weather stays dry, they can even be used outside. We use colour-changing LED bulbs, so you can choose a colour to complement your wedding colour scheme, or how about going for something completely different and bold, to surprise your guests? 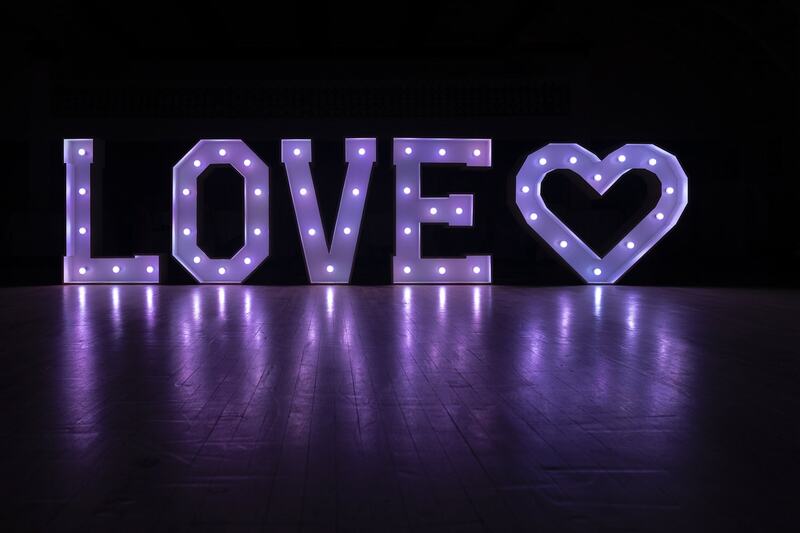 If you think our twinkling, hand-built love letters are just what your big day needs, get in touch for a chat and we’ll put together a package for you. If you’re keeping it classic, the simple “Love” Letters are amazing. Not only is it where we started our Love Letters it’s also one of our most popular orders. While nice and small they fit in almost every venue without holding back on impact. The standard “LOVE” is great value at only £125. You can also add the wooden Love Heart for only an extra £49 and can be used as a combination or as a replacement of the letter O. Another Classic design is the simple “Mr & Mrs”. We also understand that every couple is different and that not every couple will wish to have this combination so we are happy to also provide any of the following combinations such as Mr & Mr, Mrs & Mrs, Mr & Ms and Ms&Ms. If you have any other combination you would wish to have please do contact us. Any of these title combinations are only £175. We have worked hard on producing over 100 letters and because of this, we can create almost any word possible including your new joint surname. This also includes a smaller title on top, like above this, can be changed to suit any of your new titles you choose as a couple. If you still have some questions, take a look below for answers to the most common things we get asked. Are your letters only for use at weddings? Not at all! They are a very popular choice at weddings but we hire them for birthday parties, wedding anniversaries and all sorts of other functions. How big are your letters? 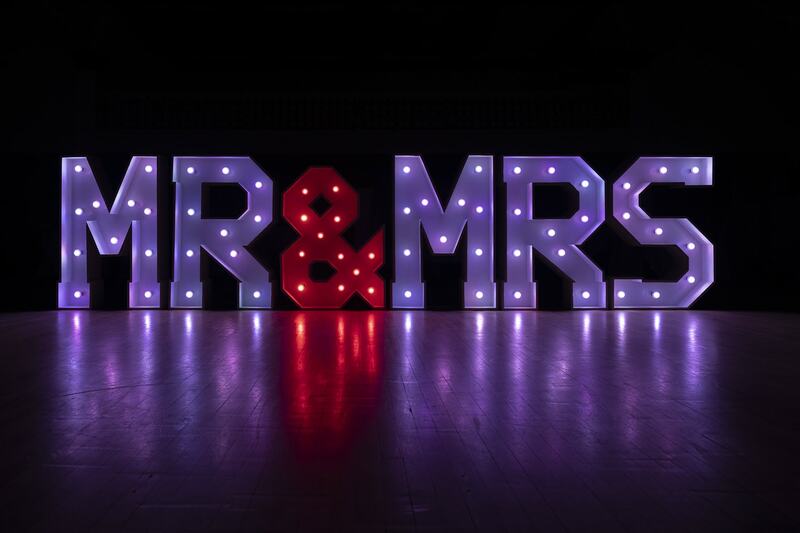 All of our main letters stand 4ft tall, 850mm-wide and 200mm deep, with our smaller ‘Mr & Mrs’ letters being just 1ft tall. Why do you use LED bulbs? We used to use filament bulbs but they get very hot, don’t last long and are very fragile. The LEDs we use now are stronger, longer-lasting and remain cool, so are much safer. Are all the bulbs the same colour? We ensure that every display we do has the same type of bulbs across all letters, so there are never issues with mis-matched colours or shades. They are not 100% waterproof but if a drink is accidentally spilt on them they will be ok with some TLC. However, they are not intended for outside use. How much power do the letters need? The letter with the most bulbs (13) only consumes 65W of power and all others are less than that. Will you supply us with extension cables? We always bring a big selection of extension cables with us. How much space do the letters need? We recommend that each letter has about 3ft of space to stand in, so they don’t look too clumped together. Can we have more than one display? Absolutely! We have done a number of events with two or more displays of letters and the more letters you have, the more discount we can offer. How many letters would you recommend for the best display? You can have as many or as few as you would like, depending on the size of room you have. Our letters look great whether you have just a couple or spell out whole words. Usually we do a 24-hour hire period but we can be flexible with this and extend the hire, as long as we don’t need them for another event. What happens if a bulb blows during our event? We always leave some spare bulbs just in case but so far, we have never had a bulb fail during an event. Can we buy the letters from you? Yes. Most of our letters sell for around £250 each, depending on which letter/s you would like.